The Central Health Equity Policy Council is a coalition of 60 community partners who advocate for health equity in Travis County with the goal of achieving wellness for all. In January 2016, the Central Health Equity Policy Council chose to work toward an Austin-wide tobacco policy to prohibit electronic smoking devices anywhere traditional cigarettes were currently banned. 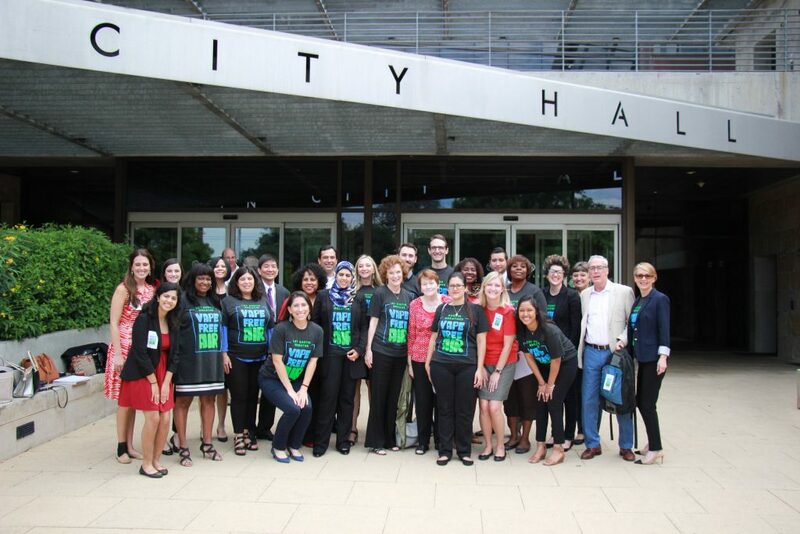 After a year and a half of hard work, the Policy Council celebrated a major victory for the health of Travis County residents. On Thursday, June 15th, the Austin City Council voted unanimously for a resolution to direct City staff to draft an amendment to the existing Smoking in Public Places Ordinance (SIPPO) to include electronic smoking devices. On June 22, 2017 the Austin City Council passed the proposed amendment to SIPPO prohibiting electronic smoking devices anywhere smoking is already prohibited. The ordinance now bans vaping in bars, restaurants, parks and other public areas in Austin. The amendment went into effect on Monday, July 3, 2017. The proposed change was to include the use of an electronic smoking device in the definition of smoking and further define electronic smoking device. The amendment now includes electornic smoking devices and defines them as any product containing or delivering nicotine or any other substance intended for human consumption that can be used by a person to inhale vapor or aerosol from the product. The term includes any such device, whether manufactured, distributed, marketed, or sold as an e-cigarette, e-cigar, e-pipe, e-hookah, or vape pen, or under any other product name or descriptor, and any aerosol, liquid, or vapor used in such a device.